Having come of age and come out as a lesbian in the late 70’s and 80’s, lesbian feminist bookstores were plentiful, and they were essential gathering places for me and my peers to get our music and literature, and to be with our tribe and feel connected. Sadly, most of these shops are long gone, so imagine my surprise, (I couldn’t resist this nod to Holly Near! 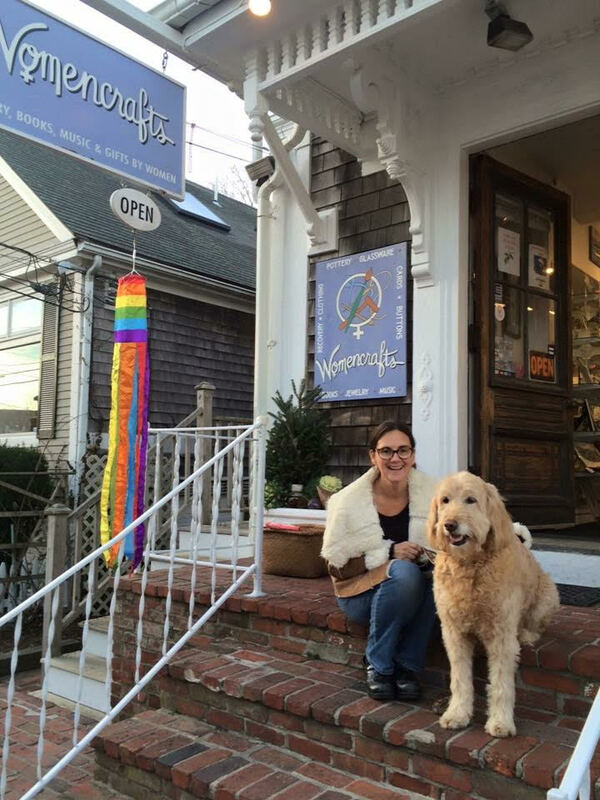 ), when I first set foot in Womencrafts in 2010, the year I moved year-round to Provincetown. Walking into Womencrafts that day, the warm greeting from the women behind the counter, walking around the shop, taking it all in the beautiful craftworks made by women artists; pottery painted with figures of women dancing in the moonlight painted on them, labrys pendants in the jewelry case, stickers and buttons, women’s music…all brought back a rush of feeling of belonging that I hadn’t had for a long time, and didn’t realize how much I was missing all these years. The familiarity and the energy of the place immediately brought to me a feeling of coming home. And Womencrafts did become home for me. My very close friend here in town started working at the shop, and I found myself stopping by the shop regularly. I loved talking with getting to know the other employees and the former owners, Kathryn and Wendy, and loved seeing what new items had come into the shop.. Eventually, in the spring of 2013, I was fortunate to join the staff at Womencrafts, and continued working there for 3 wonderful seasons. It was a whole other wonderful experience on the other side of the counter. Some of my favorite times in the shop were the conversations of women telling their stories of their visits to the shop over the years; the first time they visited the shop, maybe even as far back as the early years in the 1970’s, or of the first time they were asked if they wanted the dyke discount, which often was the first time they ever come out in in public. I loved seeing couples looking through the jewelry case and discovering that we still carry the rings they bought here years ago; commitment rings for couple’s whose love and union was not yet seen as legal. Working here I really got to see how important Womencrafts is to the loyal customers who return to the shop every summer, year after year. After Michelle became the new owner, I was thrilled to be working with my friend and to be part of the transition the shop went through. It’s been exciting to see first hand how this place has evolved over the years, and how it still remains and maintains its unique energy as a very special place; so much more than just a store. I love how on slower days, and in the shoulder seasons Womencrafts is a gathering space for local women, we have postcard parties, storytelling nights, and simply catch up on the sunny stoop. I’m proud to be part of the story of Womencrafts and excited to watch as more unfolds.